Creative ideas for job application? Go on the Lush website and look at what they do and what their aims are. They aren’t the same as Body Shop or anywhere else that I have been. The staff know about their products – care about what they do. They are against animal testing. They seem to have a sense of humour-fun. Look at the way they write on their products. If you can draw, maybe a cartoon type picture showing you, with a big smile, helping a customer? Or a short poem – not too serious, about you, and how you think you will fit in with the shop’s ethics. Or try a product – like a bath bomb and describe the experience of using it – and big it up a bit. Don’t leave it too long or the job will have gone. Good answer I thought, you can’t add to much to that! 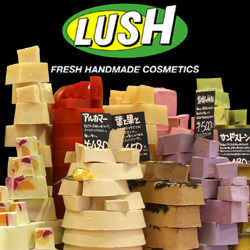 What amused and engaged me more though, and hence to write this blog entry, was that Lush Cosmetics were recruiting a “type” of employee who was enthusiastic, without actually stipulating anything which in any way could be construed as discriminatory. If you understood Lush and its approach, then there is not a lot stopping you from applying and getting the job. How original, distinct and – superb! They are basically recruiting a set of people who believe wholly in the product and service concept, and hence don’t have to sell: they just have to let their own enthusiasm and knowledge of Lush Cosmetics flow through. Look at the way they write on their products. If you can draw, maybe a cartoon type picture showing you, with a big smile, helping a customer? Or a short poem – not too serious, about you, and how you think you will fit in with the shop’s ethics. Or try a product – like a bath bomb and describe the experience of using it – and big it up a bit: I like all of this, except the last bit. If you have passion for the concept and product, then “bigging it up” will come naturally with your passion; if you don’t have passion for the product or company, then it will come across as false. As an interviewer, the difference on the far side of the table is horribly distinct, but to a job seeker it seems absolutely minute. Other ideas I had from reading both the website and the article were that Lush has a foundation in the cheese shop style of presentation – why not wrap your CV in something, around something, or cut it distinctly or make an origami presentation of it? My thoughts in closing: Lush seems like a wholly fun place to shop, let alone have the great distinction to work in – but only if you have passion for the product, which they weave into and hence test throughout their job application process. Secondly, 11/10 for Lush in creating a distinct employee attracting brand and proposition which avoids any form of discrimination – no wonder you are in the Times Top100 places to work. Hi, sweet site! I genuinely appreciate this blog post. I was curious about this for a long time now. This cleared a lot up for me! All wonderful suggestions here. I’m going to pass along this post to our recruiting team at my day job at Monster!